While we wait patiently for Spike’s airing of GT Academy 2012 this fall, we have three new pieces of DLC and Update 2.08 releasing on Tuesday, September 25th to keep you guys battling in Gran Turismo 5. Relive the victory with the Nissan GT-R N24 GT Academy ’12, winner of the SP8T class in the 2012 Nürburgring 24-hour race. The GT-R N24 GT Academy was developed by the GT-R development team of Nissan, and set up by software engineers of Gran Turismo. Driven by Gran Turismo series producer Kazunori Yamauchi and the first European GT Academy winner Lucas Ordonez, Team GT Academy won top victory in the SP8T class. 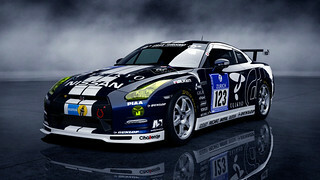 Relive the victory at the Nürburgring with this signature GT-R N24. 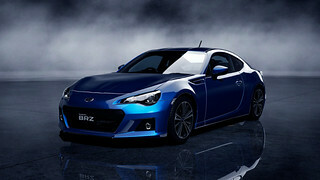 Enjoy the natural feel of a compact front engine rear wheel drive (FR) sportscar by adding the Subaru BRZ S ’12 to Gran Turismo 5. Sharing the specifications of the Toyota FR-S, the production model prototype was announced at the Tokyo Motorshow in November 2011. In addition to the different front grill and foglights, the driving feel of the suspension settings focuses more on stability, and reflects the sports car philosophy of Subaru. In the BRZ, you can enjoy the feel of an FR layout sportscar — a rarity in today’s automobiles. Add the official Honda Weider HSV-010 (SUPER GT) ’11 that competed in the GT500 class of Japan Super GT series to Gran Turismo 5. The HSV-010 debuted in 2010 as the heir to the Honda NSX-GT. 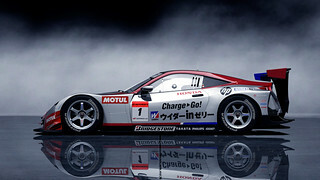 The car is a front engine rear wheel drive powered by a 3.4 liter V8 based on an engine designed for the Formula Nippon. The car achieved a double title win in its debut year, and this 2011 model utilizes side radiators to optimize weight distribution, further improving its cornering performance. Add this high performance Honda Racing machine to your collection. Now possible to select “Disable collisions” in the [Event Settings] of online races. ID’s are now shown above cars when watching online races. Response of the clutch pedal when using the steering wheel controllers “G25 Racing Wheel”, “G27 Racing Wheel”, “T500RS” and “TH8RS” has been adjusted. Rate of tire wear in endurance races has been slowed (excluding formula cars). Amount of air resistance change when altering aerodynamic wing settings has been increased. Autopilot has been adjusted to prevent colliding with the wall when exiting the pit lane on the Tsukuba circuit. I can’t wait to get home today will be getting this! Yaay more Nissan. Can we please get some other DLC that isn’t Nissan or from Japan? GT5 is the best as were all previous versions. Long live Polyphony! the improvements to the game are good as is the pricing on the individual cars. But sorry the cars themselves won’t bring me back to the game. Don’t get me wrong I played the heck out of it but more rehashed japanese care variations just doesn’t cut it. Theres already far too many very similar cars in the game as it stands, and after the poor handling of some of the previous DLC cars, most notably the VW beetle from a previous DLC I’d want to see them in action before buying. And for those who don’t know the one VW I mentioned the handling problems, it wasn’t a minor glitch, the car would do some extreme rollovers & spins even at ultra low speeds (sub 10 mph) and it wasn’t an isolated incident. If you’re gonna bring out more cars as dlc please do give us more variety. Theres plenty of brands already in the game who’s more popular past models are not represented at all, say 308 GTi or GTb as just one example and there are others. This is a note to the blog team. For the second time in 2 days my comments are being censored. yesterday a post simply dissapeared for several hours with no reason or excuse given. This time its the excuse of “your comment is awaiting moderation” yet in both instances theres no swearing, defamation, or other insults, no spam or links to outside sites. Seriously it makes the lot of you look amateur hour and I doubt thats what you really want. Please do step up your game and make things work cause it just looks bad on you. More dlc for this game? Can you just stop now and release a “complete” version of the game. I like gran turismo 4 because it’s chalked full of unlockable cars. I will not buy this game because you keep releasing new cars for it that I need to buy. You made a version of the game that came with voucher codes in the game for some of the dlc up to that point. Sorry but voucher codes are not good enough, a “full” game would be great though. I’m sure I am not the only one holding off on buying this game till it is complete. Just a suggestion. Now comes the hate I’m sure. First let me say that I am a huge GT fan and have been playing the series since it’s first game on PS1. With that being said, I would like to express how disappointed I am at each pathetic DLC offering that has been put out by PD. You have to pay for a BRZ when the FR-S is free? You do realize it is the exact same car with a different badge right? Yet more Nissans and Hondas. How original. Anyone been following the fantastic car packs that Forza offers? GT’s car variety is not even close to Forza’s. They get all kinds of wonderful new and classic cars from all over the world, and PD continues to give us yet another Skyline/GT-R or Honda to add to the 300 already there. What a joke. GT5 is the best console sim out there at it’s core, but with the absolute worst car collection and DLC. They are better off making many of the standard cars into premiums rather than doing what they are doing. Or at the very least fix the cockpit view on the standards! They don’t even have the hoods rendered, just a black cut out of the dash! Even the PSP GT had hoods rendered in cockpit view! THE SUBARU BRZ IS JUST A TOYOTA 86… YOU GAVE US THE LAST GTR N24 AND 86 FOR FREE NOW WE HAVE TO BUY THESE ONES WTF PD……..
1) I’d wanted new DLC tracks since day one, but when they released I couldn’t earn XP or credits with them. No sale. 2) Load times are far too long. I get very little time to game these days (mech. engineering student), and when I do, I want to actually be *playing*. Whatever is done in the game (beginning/ending a race, opening/closing a menu, etc.) results in a long load time. I have not had similar (several minute) load times in any other racing game, including competing sims like Forza. Given that the effect of tweaking the tuning options is rarely obvious, getting to adjust, say, wheel positioning or LSD settings results in several minutes of waiting. Then, you wait to open a race and again to close it. Then you tweak the settings again… by the end of it you’ve nailed down one setting for 1 of the game’s 1000 cars and have used up an hour. Why put tuning options in the game if you’re going to discourage me from using them by design? Simply put, GT5 is a great game, but I doubt I’ll be putting GT5 back into my PS3 anytime soon as I feel that too much of my time is being spent staring at a loading screen. Ken Chan do you have any info on the Acura NSX Concept from the Grand Turismo 5 video back in January? Anyway thanks for the post. This game, or at least GT6, needs **** TON more Classic Ferraris. I am not sure if these cost a lot or whatever but seriously WTF and where the **** is the 250 series which are probably the most legendary cars on the planet. 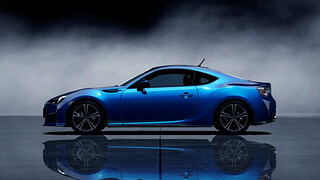 PD stop making the GT86, FRS, BRZ for GT5 there is already like 5 versions of this car in the game, put a new car in, something that isnt already in the game, i dont care what it is but something new not just the same car with a different badge!!!! Did you really pay people to make the same car again? You’re getting ripped-off if you did. Go and look at some other racing games, they let you change paint-jobs and put stickers on cars you already have, just don’t charge you a dollar to do it. More NEW cars. More European or American cars. More classics. Stop re-hashing the same old Japanese cars you’ve done since the first GT. @dothekiller91 I agree I’m tired of having 10 different models of Nissan gtrs and no insana cars car companies like koeniggsegg gumpert are on all the other games but not his one? I’m really happy to finally try out the hsv, didn’t think it would ever make it into the game. No point in gettin a BRZ when we have a toyota 86. Its the same thing. “First let me say that I am a huge GT fan and have been playing the series since it’s first game on PS1. Don’t worry PD, i am for one a appreciative fan. Thank you for the upcoming update and i will sure be adding these 3 cars to my collection, keep up the good work. I read “Subaru BRZ” and already sold lol. I really want this car in real life over the scion version lol. Very rare model. This dlc is only .99, I’m not going to b**** and complain about it. We’re not forced to buy anything we don’t want… I’m thankful PD continues to support the game till this day. Hey, First of al, I wholeheartly agree with complainers regarding DLC… heres good question: why do you have to limit to certain cars you “like” or favorism or monopoly over customr’s requst to create something thar would bing them back into world of GT itsel. But here so far, I see you all do is rehashing same production like 150 to 300 nissans, Hondas and lack of American ad or European’s modern car or even concepts like Ferrari P4/5 or SRT Viper GTS / GTS-R or those classic muscle cars or supercars…. someone at Playstation.blog should take those complaint into consideration and pass along to Kaz that show we do care about his production but he seem doesnt not care about his customers. YES! Another GT-R! And one more Honda as well. Oh happy days! Exactly what I needed. …. For crying out loud. I don’t want to sound like a hater, but I’m sick of the Nissan and Honda thing as well. I love GT5 but I want to race around the track in some well-known average cars too. It doesn’t take long scrolling through the list at http://www.gtplanet.net/gran-turismo-5-official-car-list/ to realize there’s a huge gap in vehicle availability. Yo Dawg, I heard you like GT-Rs…. They should get more Ferrari’s, like the FXX, F430/458 Race cars. How can I get high-resolution versions of these images? 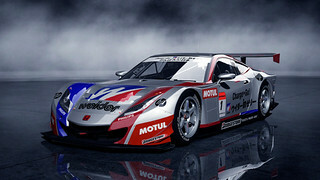 Previous GT5 blog entries about new cars coming to the game had high-resolution versions. Thanks! Look at all the nice beginning comments, then all the complainers flow in. This is my first comment on the blog and I must say, some of the most unappreciative people I’ve ever seen no offense. That’s not just another GT-R, that’s specifically a GT-R driven by Kazunori, the man with the vision behind this game. Can’t we all just play the game and have fun? Sure, you want to reach out to the devs and say hey, I don’t agree with this; but at least do it in a bit of an organized fashion. Also… @27 I didn’t see your comment but exactly. Most games still only get support for their lifespan; but that lifespan is typically 1 year. I appreciate all the work they do. Even all the updates that we’ve got for free adding new feature to the game just to keep us occupied and updated for a better experience. Seriously, keep up the great work PD, you guys are working on your next title and still releasing updates and DLC? That’s just fantastic. I’m excited if we get a Spec III update! I’m with @aronh17 on this one. I work for a software company so know what goes in to making this stuff happen and you compain about a measly $1 DLC you ‘don’t’ have to buy. personally I’d be happy with less cars and more tracks – there’s some great circuits around the world that exist in other games (especially BTCC tracks in the UK like Brands Hatch, Silverstone, Knockhill, etc. etc.). Nice, but when we get timings for next car ahead and behind when racing online? There are many small things that can be improved on online races. Tire wear last now +75-110% more than 2.07 when racing online.. hmmpf.. I don’t want to sound too much like a complainer, not being able to play online due to data usage at college but I was wondering Polyphony Digital can the next update have cars from different countries i.e. America and Europe seem to be releasing new cars every year and I do not mind Japanese cars its just that seeing a little more variety in the car pack would be nice. I got the XL edition of the game and I loved the car packs with different cars from Europe America and Japan. Release more car packs like that and people will not complain as much. P.S. I’v been a loyal fan of GT since GT3 came out and can you make it where people who have GT5P can import their cars and money because I bought single car in that game and had the most amount money you could get in that game until my system was stolen that would be nice to consider. why waste your money on the subaru, when the same exact car in the scion is available as a free download?? Just fired up Gran Turismo after a lot of months away and after downloading a bunch of updates I was good to go. Started the American Championship A-spec and when I win the time just keeps on counting up and my speed falls to 80 km/h and continues to drive round behind the other cars! This happens on all races I have tried so far. I must say, I have read and re read each of the comments before my own, and I am well aware that companies create DLC as a way to expand their games, but I can count on my fingers, and toes numerous vehicle manufactures that have vehicles that deserve to be in this game from Ford (Model A) to Gumpert (Apollo), and everything in between, but unless Polyphony Digital plans on releasing DLC for this game for the next 4 years (at the rate of about 4 – 6 vehicles per month), we may not even be able to attempt to see a glimpse of those magnificent machines hard at work, or test drive them like some of us purchase this game to do. It seems pretty unfortunate that even American companies can’t ask a team of PD guys to come to their vehicle museums or warehouses and mokap a few prototypes every few months, or hold friendly design competitions to get their cars in this game. A large portion of the cars included in this game exist in previous (Ford GT90), so why cant they get some specs from the companies, create the model, and build the car again but 10,000,000,000 times more cleaned up and detailed? It would be cool to see every single car that has been manufactured in the world actually placed into this game, and then the premium versions as optional features instead of full on car models that can’t be adjusted. The possibilities would skyrocket from there, and the competition would implode because of the might of that kind of game, but instead we get 500 Nissan vehicles, 200 Toyota vehicles, and then 386 additional cars from all the other various companies. The Mazda 787b doesn’t even make an appearance, so I know there are tons of cars that could still be put into the game, and have room for improvement. As a gamer I know firsthand that even the best game could use improvements somewhere, but this was just the obvious choice this time. BRING MORE CHOICE INTO THE GAME. MORE OF THE OLDSCHOOL MOTORS, MK1-5 ESCORTS, CAVS, FERRARI, JAG, JENSON (GT4 HAD IT), RELIANT, MG, DODGE, CHEVVY, BMW. THE LIST COULD JUST GO ON. its a game based all around the world and yet theres a handfull from it, 3/4 must be Japanese. please bring more selection as others have said, forza is kicking it with the motors and in game options. the engine and drivetrain change must be the best ever game feature for a car game! TAKE NOTE!